May 2018 added another dimension to the GT program at MMS when we were gifted with a Flash Forge 3D printer from the Perloff Foundation. This new technology combines programming, creativity, and real-world problem-solving for students. It enhances content area subjects with the building of models. Students are able to create 3D objects, print them, and then make adjustments and reprint again. This is true learning as students visualize their intended outcome and then problem-solve the issues and try printing again. Creativity, measurement, programming, and math, are all skills inherently used when building with the 3D printer. In the first weeks of school, grade 7 and 8 teams were introduced to the world of 3D printing through a tutorial using Tinkercad and learned all the basics of the program by building a wrench. 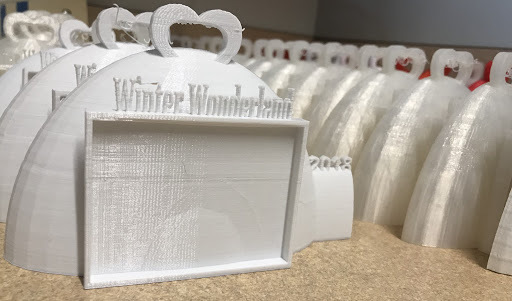 These teams were challenged to create a “Winter Wonderland 2018” frame/ornament for MMS Winter Wonderland day for all kindergarten students in our district. Emma Wiswell took this honor. She asked for feedback from other students, took adult feedback and went back to the design process many times. Her final product is awesome. Special thanks to Josh Brooks and his students for helping us print some! Grade 6 students, once they complete Code.org accelerated course, are given the challenge to learn the TinkerCad interface and then look at and “change” the code of a penguin (already built/coded) within TinkerCad. Ms. Fish challenges them to create their own snowman with personality and put a hole in it to use as an ornament. We had two students complete this challenge (Isabella Korbet and Alexandra Wyatt). They started it during the course and then finished it on their own after Digital Citizenship ended. We printed their snowman. Alexandra Wyatt with her snowman design.